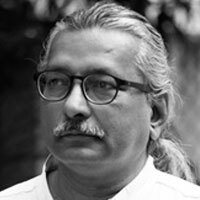 Girish Doshi is the principal at Navakar Architects, Pune and also a much loved teacher of architecture. He graduated from BKPS School of Architecture, Pune and apprenticed with Balkrishna Doshi at Sangath for seven years. He began his independent practice in 1987, which is responsible for a wide range of projects- private houses, schools and institutions and public buildings. He is a recipient of the J.K. Cement Architect of the Year Award in 1994 and AESA- Kumar Architect of the Year Award in 1995.
for 30 years. It emerges out of a simple realisation that architecture is not a simple manipulation of forms and materials, but is about construction of space and place; and in this, light plays a decisive role in design. In all this, there is a conviction that the aesthetic truth of these ideas will in some measure contribute toward a dignifying human existence. The exhibition was shown as a public display at MES Pillai College of Architecture, Navi Mumbai. mitigate harsh sun or rain, to bring in light or to meet his client’s budget. Doshi is not a man of many words as mostly he prefers his work to speak and express itself. In this conversation, he opens up about his life as a student, an apprentice and an architect trying to shape his client’s dreams. We get a glimpse of the architect as a person whose life story is not removed from his work. Tell us something about your formative years, your experiences of working with Balkrishna Doshi and Anant Raje. After joining Architecture in Pune Government School (now BKPS) in 1974, I failed in my very first year in the subject of theory of structure- just by two marks! If I look back now, it became an opportunity more than a failure as I found “Oeuvre Complete” – a set of books containing complete works of Le Corbusier. The impact of his work, the plans and sections was so great, even with my limited knowledge of English, it completely amazed me.